The five HIMOINSA Team riders have managed to complete the first half of the toughest Dakar ever disputed in South America, with the full team safe and sound in La Paz, looking to keep up the fight. Gerard Farrés anchors his position in the Top 10 in a very competitive and entertaining edition at the head of the race. Dani Oliveras, after two memorable days, tackles the Bolivian stages already within the best 20, making a surge as the clear revelation rider. Marc Solà stays consistent and gains positions coming out of the Peruvian desert, looking to compete for a spot in the Top 25. Iván Cervantes overcomes a tough few days due to sickness, increasing his pace as he recovers physical shape. Rosa Romero hangs on after a devastating week from a physical and mental standpiont, staying on the gas and making no mistakes. January 12th, 2018 – La Paz (Bolivia). The toughest Dakar of the last decade enjoys a well-deserved day of rest this Friday in the capital of Bolivia, where the five HIMOINSA Team riders take the opportunity to get their bodies and motorbikes ready to face the second week of the race. Considering what happened during the first six stages of the 40th edition of this Dakar, the Spanish team’s performance can only be described as outstanding. Of the 337 participants who took the start in Lima, the Peruvian desert has claimed none less than 88 victims from all categories (26.1% of withdrawals), many of them among the favorites for victory. 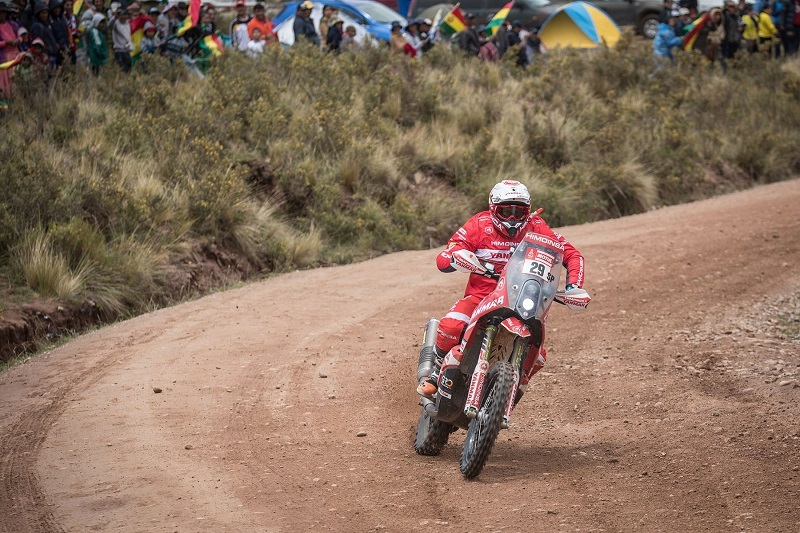 More specifically, in the category of motorcycles, of the 167 riders who started, already 29 (17.3%) have been forced to abandon, with stages as complicated as the second one (Pisco-Pisco) in which there were up to 11 casualties in this category. Keeping this in mind, it is remarkable that the HIMOINSA Team has managed to keep its five riders in the race, when the statistics dictate that at this point they could have had one or two withdrawals easily, which makes them the best private team of the event. This speaks volumes about the work ethic, the planning, the experience and the team spirit within the structure directed by Miguel Puertas. Gerard Farrés is firmly installed within the Top 10 despite the intense battle that is being waged at the head of the race, where there have already been four stage winners and four different overall leaders in the first six days. Farreti has been one of the most consistent in all conditions, and this puts him in a perfect position for the second week of the rally. Dani Oliveras is already considered to be the great surprise of this Dakar 2018. The HIMOINSA Team rider is demonstrating all that he is capable of in his fourth participation in the race. Oliveras has achieved his best results, with a sixth (stage 5) and especially, the fifth place achieved in the sixth stage, when he rode in second position for a good portion of the day. A showing of potential for the Spanish rider, who made clear his intentions and his aptitudes to fight against the official bikes in any terrain. The team’s rookie, Marc Solà, has also weathered the storm from this first week of Dakar. Overcoming the dunes and the heat of the Peruvian desert, Marc Solà is already lurking around the Top 25 of the classification. Iván Cervantes started the race with a 39-degree fever, which proved to be a huge handicap during the very hard stages in the dunes, where the physical factor and navigation played a fundamental role. However, the five-time World Enduro Champion has been able to manage this difficult situation to reach La Paz, gathering strength to face the second part of the race in better conditions and on possibly more favorable terrain.